I received payment confirmation but I don't see my subscription anywhere. You will receive an email with all the Subscription details and activation instructions in 10-15 minutes after your payment has been finished. Thank you for your patience. 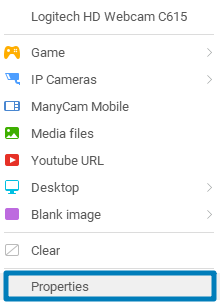 How do I activate ManyCam? I purchased the subscription, how do I remove the ManyCam watermark (logo)? First, please activate your subscription. Please refer to this guide. Once you’ve activated the subscription, please go to ManyCam menu bar → Preferences → General settings and uncheck the “Show ManyCam logo” box (Mac users only). I'm getting “Activation limit reached”. What do I do? Activation limit reached message indicates that you don’t have spare activations left. This is the most common error when activating ManyCam. The mca.manycam.com seems to be blocked by your firewall and/or your ISP/network/router. Please make sure that you do not use any Proxy. Check that you have an Internet connection. Please disable/reconfigure your antivirus programs that may block ManyCam. How do I create custom effects in ManyCam? There are two versions of Skype currently available: Skype Classic for Desktop and Skype Metro app. Both versions are active and receive updates from Microsoft. With the introduction of Windows Anniversary update, ManyCam is no longer compatible with Metro applications. Therefore, we suggest using Skype Classic for Desktop with ManyCam. Some apps, like Skype, for instance, can scale the resolution down based on your Internet bandwidth, meaning despite ManyCam is sending video in 1080p, Skype will be scaling it down to 360p automatically if your Internet connection speed is too low or unstable. The same issue might occur in other apps. This is not something that can be fixed in ManyCam since ManyCam always transmits the video feed in resolution you’ve selected in the Video tab. How can I stream from a Facebook Business page? I’m trying to add an IP Camera as a video source, but ManyCam can’t connect to it, I’m sure I put all of the information in correctly what should I do? Many IP Cameras have some extra information that may be needed in order for ManyCam to be able to reach them. The most common fix for this problem is to input the IP Address as follows. Replacing [IPADDRESS], [USERNAME] and [PASSWORD] with the appropriate information. These websites use Adobe Flash Player to find any video sources, please make sure you have the latest, stable, version of Flash Player. You will also need to click “Allow” on all the pop-ups and confirmation boxes that are requesting the use of your cameras and microphones. When I try to stream HD video into a website it becomes unplayable or the quality drops significantly, how can I fix this? Streaming HD videos takes a high upload speed, generally 4Mbps+ to see if you have a good enough connection to do so you can go to speedtest.net and check out your upload and download speeds. Although you may need to have higher upload speeds, you can stream 720p video with an upload speed of ~3Mbps without too many issues. Why doesn't ManyCam work on Windows 8.1/10 Metro apps? With the introduction of Windows Anniversary update, ManyCam is no longer compatible with Metro applications. How to get MP4 (and other formats) videos to play? ManyCam uses Microsoft DirectShow technology to open media files like MP4. If you have problems with opening videos in ManyCam, most likely you do not have the appropriate DirectShow filters installed. Can I rename a custom video source in the latest version? Yes. We’ve brought back the Custom Video Source feature that allows you to give a new name to the ManyCam Virtual Webcam video source. Please note that this feature is only available for ManyCam Studio and Enterprise Licenses. Why won’t ManyCam recognize my TV capture card? ManyCam is a webcam software and we cannot guarantee that it will work with TV tuners and standalone camera devices. However, ManyCam may work depending on the camera vendor and its software. I cannot make use of my 4 USB webcams simultaneously. Webcams tend to use a lot of USB bandwidth and separating the cameras onto different USB host controllers (i.e. 3 in front, 3 in back or 2 in front, 4 in back etc) can potentially help reduce the bandwidth load on each controller allowing your computer to read more Webcams at a time. Please try distributing your cameras between different USB controllers by connecting them to the front and to the back of your system unit. 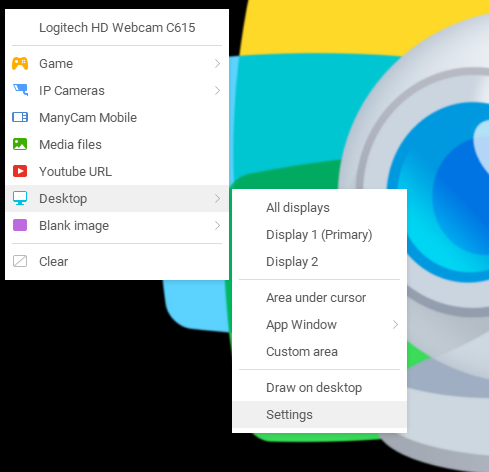 How can I view and change my webcam properties (focus, exposure, etc.)? You can view and change your webcam properties on the main Live Source video window. Right-click on the main video window, and choose the “Properties” menu item. Where can I find the “hide mouse cursor” option? Click on the Live Source video window and navigate to Desktop → Settings submenu in our list of video sources. You will find this option in the opened settings window. Does ManyCam work with Omegle? In case ManyCam is not showing as a webcam option, please try connecting in Firefox. Why won’t ManyCam work on Windows Server? My Antivirus is blocking the ManyCam installation. Is it safe? Many anti-virus companies are now classifying toolbars as PUA (Potentially Unwanted Software), PUP (Potentially Unwanted Program), or simply as Toolbar. All toolbars are classified as such even if they are not actually malware. We bundle a toolbar in our product. This is harmless as the toolbar is clean. If you do not wish to install the toolbar please make sure to uncheck the boxes or click on “Decline” in the installer. How do I revert my browser settings? It is possible that you selected to change your browser settings during the installation. To change them to different values, follow the instructions for your browser. These instructions are valid for Internet Explorer 11 and may differ slightly for other versions. Home page. Press Alt and then “T” to access the tools menu. Select Internet Options. In the General tab, delete the URL written in the Home page section and write the one you wish to use. Click OK to confirm the change. Default Search. Click on the gear icon in the top right corner. Select the Manage Add-ons menu item and then select Search Providers. Follow the instructions on the screen to set a different search provider as your default, remove one or add a new one. These instructions are valid for Firefox 33 and may differ slightly for other versions. Home page. Navigate to your desired home page. Then select and drag the icon in the address bar (next to the url) to the house icon in the top right corner. Once you drop the icon, you will be prompted to confirm the change. Default Search. Click the down arrow of the top right search box. Select Manage Search Engines… Then select the search engine you would like to remove and click Remove. As of Chrome 35, it is only possible for 3rd parties to change the browser’s settings via an extension. Click the Settings icon in the top right corner and select the Settings menu item. Click the “Disable” button next to the extension which is controlling your Home page or default search settings. Please note that this will completely disable the extension. The Effect file is corrupted. Please try to download again. The “.mcv” file format does not currently support Animated background effects. Effects from Filters and Distortions categories are not currently supported. Some of old effects may not be supported. I'm trying to add/edit virtual device but it gives me an error that says “Communication with the driver failed”. What should I do? Please refer to the following guide: virtual webcam driver-related issues.